The Fair Trade Futures conference that took place in Oxford on Saturday has been well reported and captured, but, before I head over to start tidying up and re-posting the fantastic content created by Amplified on the main Oxford Fairtrade website, I thought I would add just a few quick reflections on the day. 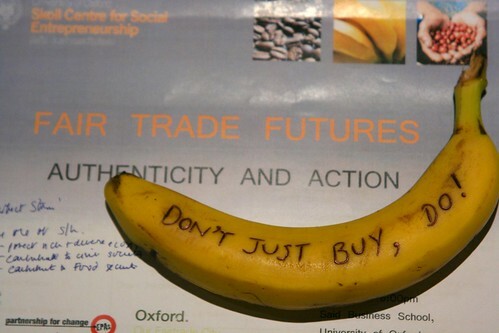 As inscribed upon a banana by @oxfordsing, this ‘slogan’ captures the tension at the heart of the Fairtrade movement right now, and a thread running throughout the day. As Fairtrade reaches the mainstream, the connection between Fairtrade and activism, and the importance of linking Fairtrade with Trade Justice can become dilluted. Fairtrade is about building ethics into purchasing decisions, but, it’s also about building ethics and justice into trading relationships. That was a point made well by People Tree founder Safia Minney who spoke of how we need to push companies to respect principles of Fairtrade throughout the production process, not just in the inputs they buy. The challenge, for the Fairtrade movement, is being in the mainstream, being a set of standards, but also being the first step for people on a pathway to engagement with wider global issues. I spent a lot of the day in conversations about the digital dimensions of Fairtrade. After a morning including presentations from Dorothea and Ian of the Fair Tracing project, and inputs from Steve Bridger and Pete Cranson on social media and Fair Trade, we spent one of the afternoon open space sessions talking about ‘Fair Trade 2.0’. Asides from discussions about how social media could lead to greater disinter-mediation of supply chains, we also discussed the transformation of trade as being ‘trade in stuff’, to being ‘trade in stuff + data’. That is, the move, led by retail giants like Wall Mart, to enable every individual product in a supply chain to be tracked from origin to consumption, with vast collections of data on products and customers collected and created. How does Fairtrade, which is in one sense, a very simple bit of data for consumers about the conditions in which a product was made, engage with this environment? As firms may be compelled to collect more data on each product, to come into line with safety regulation, how can we ensure ethical information is embedded alongside the other data that may follow a product on it’s journey? And how can that information be made meaningful and useful to time-pressured shoppers? Are ethical criteria needed to account for fair trading in the data that might travel with a product – so it does not become a source of commercial exploitation? And can the rise of a data-rich supply chain be subverted in the cause of ethics? Amanda Gore, who was blogging with the Amplified team, has further notes on the discussions here. This was a session full of questions – but one raising issues I’m sure will be cropping up more in discussions of Fair Trade in future. There were quite a few experiments going on with the Fair Trade Futures conference. It was the first time many of the organising team had experienced any Open Space sessions, and for most delegates, the first time they had been at an event being actively digital reported. I was a little nervous about the digital reporting – as I’ve seen it work well at technology events, and in youth events, but I’ve not experienced digital / social reporting in action with a community for whom social media is not part of the everyday. Yet it worked fantastically. And by the end of the day, many delegates were won over to the potential of social media to help capture, curate and continue conversations started at an in person event. There is still much to learn about how best to use social reporting to catalyse online community (for example, I would love to work out how best to equip delegates new to social media to try their own blogging and twittering from sessions, without spending too much time training them up, or distracting them from participation in face-to-face discussions), but the team from Amplified certainly demonstrated that we need to be adding digital dimensions to many more events outside the social media mainstream. If you’re reading this before 6pm on Saturday 7th November – then head over to the Amplified website to catch some of the blogging, tweeting and AudioBoo coverage from the Fair Trade Futures conference – taking place throughout the day. If you are reading this after 6pm on Saturday 7th November. Well, you can still head over to see what they’ve captured – digging deep into what Fair Trade means and what the future of Fair Trade is in the niche and in the mainstream, post economic-crisis, and in a digital world. How would you get up the web presence of a local campaign group? What bits of Web 2.0 are essential for a local campaigning group? One of the jobs I’ve taken on for 2009 is getting an online presence set up for the Oxford City Fairtrade Coalition. The coalition’s last static HTML website disappeared when the committee member who had set it up moved out of the area a few years ago, and the group is currently without a proper existence online. With the rise of the social web over the last few years, it’s obvious that I can’t just set up a new static website. I need to make use of Web 2.0 tools to really give Oxford City Fairtrade Coalition a proper presence in the online space. But what should I use? Should I leap in with Twitter, Flickr, YouTube, Facebook and more? Or is this just going to leave a trail of un-maintained web-debris? What sort of strategy should a small, volunteer run, campaigning group use to be seen on the web? Author timdaviesPosted on January 4, 2009 December 2, 2018 Categories Fairtrade, Social MediaTags campaignsite, ocfc9 Comments on How would you get up the web presence of a local campaign group? Have you asked for the Fairtrade option in a coffee shop that advertise it as an extra and been met by a bemused look from the person serving, been told that it’s out of stock, or simply been told they don’t sell Fairtrade coffee, in spite of the big Fairtrade logo on their menu? I have. Quite a lot of times. And it’s really frustrating. So, this morning I set up an @askforfairtrade account on Twitter to start finding our who the worst offenders are. If you’re a regular coffee-shop hopper and you’re amongst the twitterati, then follow askforfairtrade, and when you’re next getting a caffine fix, make sure you request the Fairtrade option. Report the response you get by tweeting an update to @askforfairtrade. I’ll aim to collate the reports on a regular basis and will get in touch with the best and the worst of the coffee chains to let them know how they are doing and to put the pressure on to keep Fairtrade on the menu. Big companies are actively misleading consumers, giving the impression that their coffee is ethically produced and certified to Fairtrade standards, when in fact, Fairtrade is only available as an optional extra, and no effort is taken to actively encourage customers to ask for Fairtrade. In fact, from my experience, the level of service when trying to ask for the Fairtrade option actively discourages it. By collecting reports of whether or not coffee shops and chains are living up to their promise to provide a Fairtrade option we can put pressure on them to make sure staff are trained, and products are in stock, for choosing the Fairtrade option to be the easy option. And we can demonstrate the consumer demand for Fairtrade as standard.